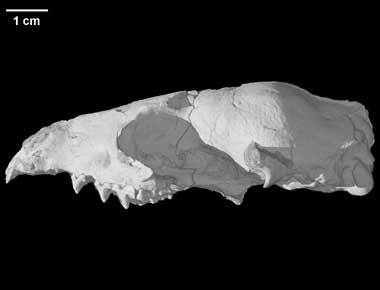 This specimen, the holotype, was collected from the Reeves Bonebed, Chambers Tuff Formation (Oligocene, early Chadronian) in Presidio County, Texas by Wilson et al. in 1966. 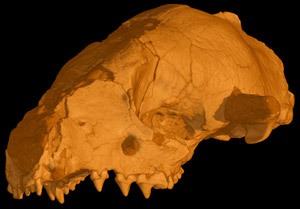 It was made available to the University of Texas High-Resolution X-ray CT Facility for scanning by Dr. Timothy Rowe of The University of Texas at Austin, Department of Geological Sciences. Funding for scanning and image processing was provided by a National Science Foundation Digital Libraries Initiative grant to Dr. Rowe. The specimen was scanned by Richard Ketcham on 3 December 2007 along the coronal axis for a total of 1010 slices. Each 1024x1024 pixel slice is 0.08551 mm thick, with an interslice spacing of 0.08551 mm and a field of reconstruction of 40 mm. To cite this page: DigiMorph Staff, 2008, "Miacis cognitus" (On-line), Digital Morphology. Accessed April 24, 2019 at http://digimorph.org/specimens/Miacis_cognitus/.